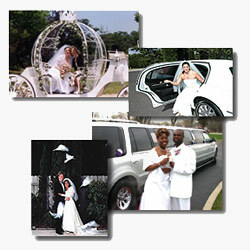 Alpine Limousine is the premier Miami and Ft. Lauderdale wedding limousine service around Florida. Once you let Alpine Limousine be the transportation for your Miami Wedding limousine, you will want to get married...again! We offer the best, most complete and wellprepared Miami wedding limousine service possible for your special day. We help you make your Miami Wedding Limousine and Ft. Lauderdale wedding limousine a special by including a Rose and Champagne Let us treat the bride and groom how you deserved to be treated and get you to the church on time! Then say SeLavue as you ride in style to catch your awaiting airplane or steamship - on your way to a great start of a very romantic Honeymoon! Have us pick you up when you return - for the final polish to the unforgettable time in Your life in our Miami wedding limousine and Ft. Lauderdale wedding limousine! Treat those special relatives from out of town on a tour of the city while they are here. And...don't forget the Bachelor and Bachelorette Parties. You can have more fun in a limousine - and we're the designated driver! * Rates are based on the 3 hour time frame. ** Tolls, Parking and Gratuity is not included. *** Traveling fees may be applicable.